Robert Llewellyn reviews Parrot’s AR Drone! 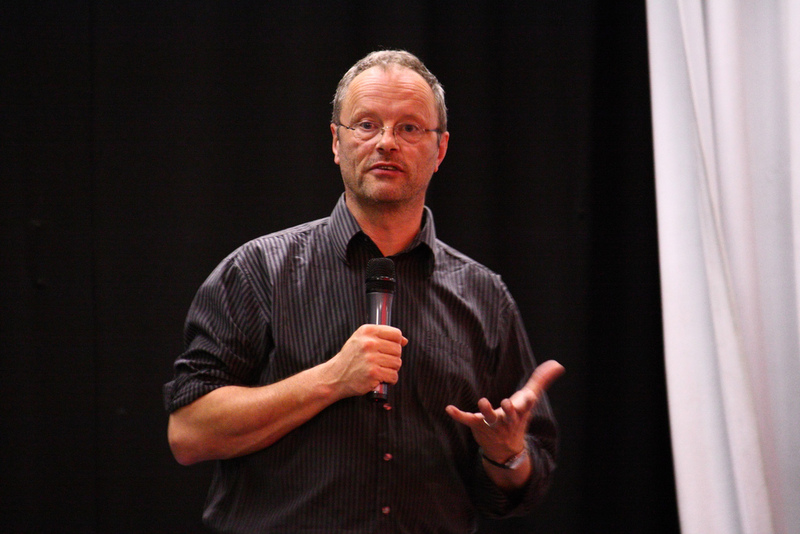 Robert Llewellyn accepts that he is possibly best known for his role as Kryten in BBC’s Red Dwarf and as presenter of Channel 4’s Scrapheap Challenge. A self described amateur nerd, Robert has always been interested in technology and engineering but due to his chronic dyscalculia had to accept he was probably better at talking about it than trying to measure something and then build it. It instantly took me back to when I was about 14 years old, pure awe and excitement at seeing what this incredible little machine can do. I can remember opening mysterious boxes when I was a kid to find a model airoplane, or my favourite, a model tank with working tracks, that went over carpet hills in my childhood home. 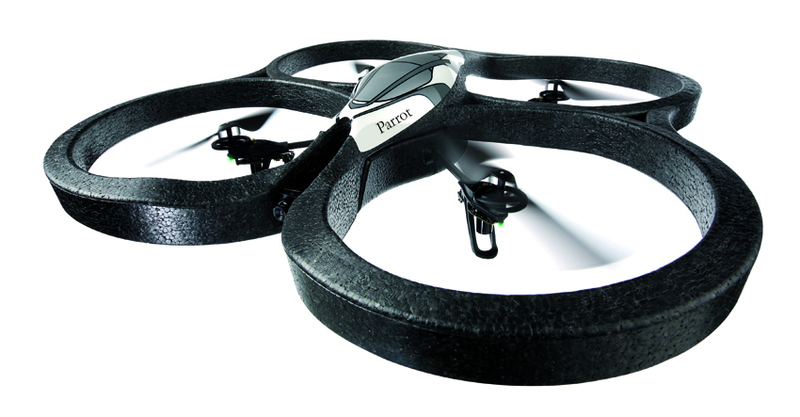 But the Parrot AR drone knocks spots off all of them, it’s a four blade miniature helicopter you can control from an iPhone, iPad, or through a browser on a Mac or PC. I assumed it would only work indoors, in a room where you had a wi-fi network and judging from the comments on the AR drone app page on iTunes, I’m not alone in that. However the AR drone has it’s own wifi network built in, you can fly it anywhere. Okay, you can fly it anywhere as long as it’s not too far from you iPhone. When you switch it on the wifi link appears on the list of possible connections in your settings screen. You open the app, ‘AR Free Flight’ and stand back. Okay, now you can sit down because the first time you use it the app takes a moment to work out the communication protocols, but then suddenly, your iPhone screen shows you the view from the front mounted camera. I saw my feet, I moved my feet and if there was video lag it was very slight. The screen not only shows you the image, it has the controls superimposed. On the left, a button to over ride the built in auto pilot and on the right, a direction button to allow you to rotate or raise and lower the scary little fellow. But here’s the best bit, you use the iPhone’s accelerometer to steer it, lean the phone to the left or right, the drone re-creates the movement. It’s remarkably sensitive, which means in a nutshell that if the machine survives your first attempt at flight you’re doing well. It will crash, it will zip across the room and whack into something. When this happens the in built motion detectors in the drone kills the motors and it crashes to the floor. If you remember to take your thumbs off the screen, it sorts itself out very quickly and just hovers at a safe distance from danger. So if it’s that hard to fly, how on earth do you land it safely? This was another feature I loved. If you can gently steer it over a safe flat bit of floor, you just press the landing button and it lowers very gently down. Once it’s landed the motors stop and it’s only then you realise how unspeakably tense you’ve been while it was flying. Taking off is also simple, you press the take-off button and the 4 tiny electric motors start up, spinning the rotors to a blur and it just lifts off the ground and stays remarkably static in mid air. It is almost insect like, a big scary insect that looks at you menacingly with it’s single eye. It hovers at about a meter off the ground without you doing anything. The AR drone’s downward facing camera (which you can also switch to on the iPhone screen) is connected to an image measurement unit which judges movement and distance, that’s what keeps it steady in auto flight. Damn clever. If you look at the iPhone screen when it’s flying, it’s very important to remember that this is not a virtual machine, it’s a real machine that can hit things, it can crash and it can break. Break as in not work again. You can’t just re-boot it if you’ve broken it, more on that in a moment. It’s only when you apply your thumbs to the control buttons that it gets frighteningly confusing for someone who didn’t grow up with game consoles. Someone like me. However, once I took it outside, it was utterly fantastic and I soon become far more in tune with making it climb, bank and turn. I found exterior flying much easier and more fun. The drone comes with an indoor kit and an outdoor evil flying beetle kit. The indoor one surrounds the rotors with moulded foam, the outdoor one leaves the rotors free and it felt to me like this gave far more control. I managed to steer it very well, I sent it surprisingly high up and on two occasions I landed it very carefully exactly where I wanted it to land. On about 35 occasions I didn’t, but it was over grass so it wasn’t catastrophic. So, all in all this is an amazing toy, there’s no point pretending it serves any useful purpose, but it’s truly great fun and fascinating to watch. So the breaking thing. The second time I tried to fly it indoors I sent it smashing into a kitchen cabinet. It fell on the stone floor and a little bit of plastic shard flew off. It was a section of one of the gear wheels below a rotor blade. My heart sank, I’d only flown it twice for about 40 seconds and I’d seriously mashed it. I got out a tube of superglue and with the deft use of my Leatherman glued the broken wheel back together. I took it outside, pressed take off and to my delight and pride up it went. I’ve now clocked up a couple of hours flight time, that’s many battery re-charges as the batteries last about 15 minutes. There is really only one drawback, the inability to record the footage coming from the cameras. The AR Drone is fitted with 2 cameras, one front facing, one downward and you can switch between the two on the fly. However, being able to record this footage would make this a 5 star gadget toy. I’ve heard there are 3rd party apps that make this possible, but to have it built in would be a sure fire win. Hopefully a software update could make this possible. Previous Previous post: Moshi Monsters Merchandise in UK stores! There’s an active hacking community around the device, which is pretty cool – various sites are springing up showing how to mod the AR.Drone, and it’s easy to source replacement parts if you do have a bash; there are also better batteries coming onto the market too. As for apps, there are a bunch out there now for both Android and iOS (and I saw a demo of a Meego one from Nokia too)… recording footage and uploading to YouTube is certainly possible.